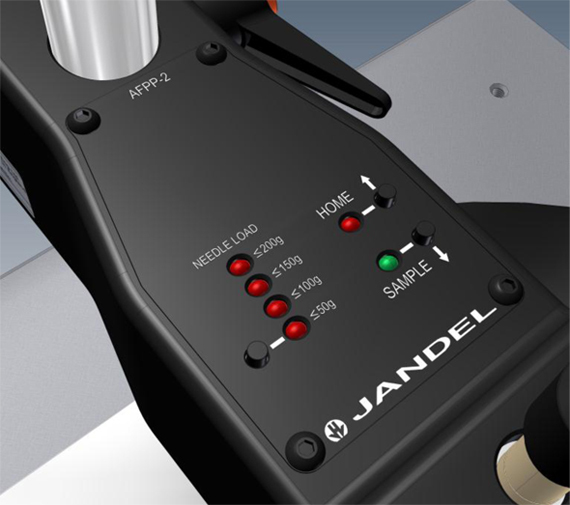 The Jandel AFPP Automatic Four Point Probe Arm is an optional motorized Z motion arm for use with the Jandel Multi Height Probe. 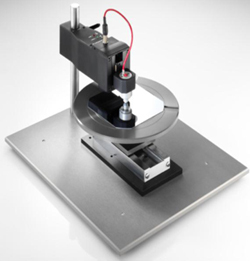 When interfaced with the RM3000 Test Unit, the Cylindrical probe head will be lowered into contact with the material under test by pressing the FWD or REV button on the RM3000 Test Unit. When the ‘sample’ button is pushed, the probe will move down to the sample, stop, and activate the switch for the current to flow. When a reading has been made, the ‘Home’ button can be pressed to raise the probe slightly so that the sample can be moved. If the ‘Home’ button is pressed again, the probe will return to the highest position. The buttons can also be set by the user to act as ‘jog’ buttons if preferred to jog the probe up and down when a button is pressed. 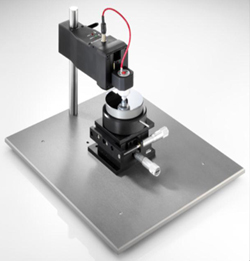 Please see the AFPP Automatic Four Point Probe Arm product brochure for more information. 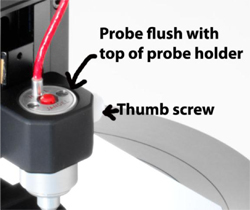 WITHOUT THE PROBE HEAD INSERTED and supporting the body of the AFPP, loosen the black handle with red button at the rear and slide the AFPP down the column until the bottom of the AFPP is approximately 2 to 3cm (1/2” to 1”) above the sample to be measured. Use the black handle with red button to tighten the AFPP in position. Connect measurement lead and AFPP power lead between the rear of the AFPP and the rear of the RM3000. The sockets on the RM3000 are marked ‘Probe’ and ‘AFPP’ respectively. The supplied power supply with transformer is not required for operation of the AFPP if it is being used in conjunction with the RM3000. Switch on RM3000 and wait for it to initialize. 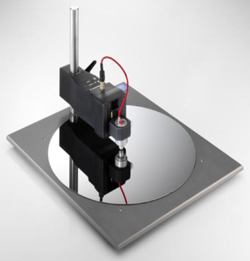 The display of the RM3000 will briefly show ‘Probe connected’ and the AFPP will home the probe head holder (move to the top limit of travel). Select the probe load based on the probe head you are using (often ≤100g). Press ‘Sample’ and make sure the probe needles fully compress on the sample. If they do not compress fully try pressing the load button to go 1 setting higher. Check the probe needles fully compress (there may be a delay of around 1 second after contact for ≤150g and ≤200g settings before the needles compress). Press ‘Home’. With the probe head and sample in place input a current and press ‘FWD’ or ‘REV’ to make a measurement. The AFPP will lower the probe head to the sample and then al-low current to flow. The current can be changed to find the most suitable current while the probe is in position on the sample, and the reading checked for validity using the FWD and REV buttons. Pressing STBY raises the probe head from the sample slightly so that the sample can be moved. Pressing FWD or REV will again lower the probe head in order for a measurement to be made. If the sample is of unknown value then while the unit is in Standby the STBY button can be pressed and the probe will inititate an Autorange function to attempt to assess a suitable current – further information on this feature is in the RM3000 manual. If samples of a different thickness are to be measured then the ‘home’ button on the AFPP can be pressed and the probe will return to home, ready for the AFPP to be set up again as described herein. If required, the AFPP can be used stand-alone in which case the supplied power lead is required to power the unit. Set up in this situation is still as per steps 1-10 above. The AFPP buttons operate as follows whether powered by the RM3000 or by the power lead. 1. 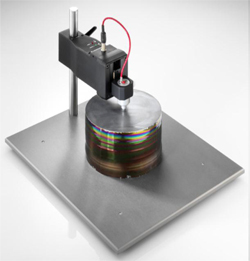 Pressing ‘sample’ will lower the probe head onto the sample and allow current to flow in order to make a measurement, this is whether the probe is at its home position or slightly raised from the sample. 2. Pressing home will raise the probe head in order to move the sample. Check that the probe is tightly held in the holder with the thumb screw.